The continued revelations of Obama’s marxist longings may be enough to close the gap for McCain. Unfortunately McCain has been to timid to face down the race card playing fools of the ledia and really give Obama a politial street fight. I think you meant to use “media.” Although I don’t think Obama is a marxist nor do I think the media is going to put out the race card or will, there is no disputing that it is in fact a street fight. I’ve read some of your comments against the wing nuts when I was at work and I bursted out laughing. I could not pipe in or go to your site and let my appreciation show, but thank you. You are my champion. I know I’ve put you on my blog roll but I have never spotlight your site and I plan to do that tonight (I’m in New York and it is not after midnight). Not that I think I have that many readers, but simply because you have something to say that impact all of us, like the article above, where once again you are on point, and just maybe someone that is still uninformed can learn something. thanks for the great compliments — you’ve been great here on the blog. Hopefully there aren’t people still uninformed and undecided out there reading my blog, but if there are I hope they get something out of this. The McCain campaign is fairly disorganized, and it has been made clear throughout this campaign season. 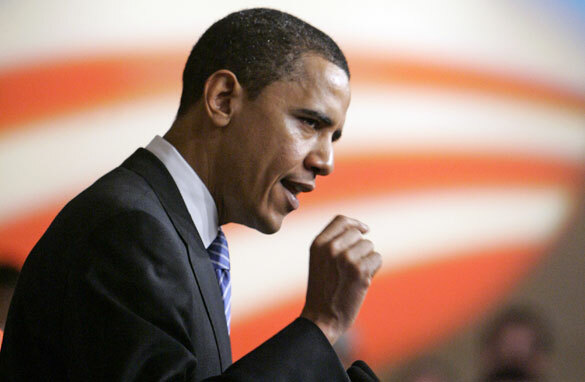 Obama seems to always step up first, and the Republicans have been counterattacking. The one time I think the Republicans took initiative was with the selection of Palin, and well, look how that’s turning out. We’ll know more about the “closing argument” when we actually get a look at the 30-minute special (which had better be really good if he’s going to hold people’s attention for that long). I think the “one week” speech he gave in Canton, Ohio yesterday is a good dry run for a closer, and it was framed as such. What was remarkable about it was how much the macro themes of the speech resembled those of his keynote at Kerry’s inauguration four years ago. It was a pragmatic speech, laced with policy proposals, but the twin themes; that of change and of American unity, are still his selling points. Obama is closing with the very same messages he opened with. Pacer, you’re right that this meme has gone unanswered. That’s the hidden dynamic of this campaign, and it mirrors the Kerry campaign’s ineptitude at defining themselves independent of Bush. McCain has defined his campaign entirely in relation to Obama, from the economy to health care to alternative energy, and in doing so he has allowed the Obama campaign to control the frames of the debate. Thus, the “erratic” meme has so much more punch, because McCain really does look like he’s thrashing around for a ledge to stand on. He lacks a compelling reason to make him President. That’s the death knell, more than demographics and race and the political headwinds. The Presidential race is still deeply dependent on personality, and McCain’s just doesn’t measure up. I think this shows the lack of message discipline that the McCain campaign has. I guess Bill Clinton was also a marxist, as Obama wants to have the tax code almost the same as Clinton had them. The problem with you and all your other conservatives is that you don’t care for others as much as Democrats do. All you say is leave for the private sector to take care of it, or the church to take care of it. Giving tax breaks to the middle class and the poor is not marxism. The constitution will not allow communism or anything like it. The world didn’t come to an end when Bill Clinton was president. Thank you for leaving a comment — and, yes — I agree to a point. There have undoubtedly been more or less repetitive shows of the McCain campaign counter attacking, but to call them disorganized is a bit vague. I think that there are many ways to say disorganized, one being the fact that they are counteracting, or another being if the campaign contradicts themselves often. great point and thanks for stopping by. hehe, I guess we all need some of that lately. Thanks for stopping by the blog! You make two great points. I agree, the 30 minute ad must be good (or at least expensive) to work, but with the hype it is getting it is bound to be one or the other. Your second paragraph is right on par. I think that one of the reason people are unsatisfied with the McCain campaign is that it is more or less centered around Obama. Likewise, Obama could have essentially run against George Bush and John McCain, but simply didn’t — rather put in his policy proposals and dreamy selling points that eats up crowds stump after stump. Thank for for stopping by and leaving a comment. What is your blog address, if you have one? I find it hilarious that the anti-Obama rhetoric keeps labeling him “marxist” or “socialist”, given that (a) Buffet and other mega-rich investors have endorsed him and (b) an independent survey of economists showed overwhelming support for Obama over McCain on economic policy — even after accounting for political bias. It’s fine and healthy to have political disagreement, but for me [as a white-collar but middle-class, independent, pro-entrepreneur, pro-small business, progressive and socially conscious voter] voting my wallet means voting for Obama. I happen to support him on a number of other reasons too, but this socialist branding is just silly. Executive compensation in the 500:1 ratio range and multimillion dollar golden parachutes for CEOs who drive a business into the ground, destroying the life savings of hard workers in the process, is not the only kind of capitalism possible. There is room in capitalism for some degree of fairness. Recognizing that and strengthening the middle class is NOT a socialist position. Over the course of the last two days Team Obama has said $250,000.00 then $200,000.00 and then $150,000.00 as those who deserve a tax cut. The ability to change the content of his stump talk to target any crowd, is only with complicity of the press and media. ie the LA times suppressing the tape showing Obama praising Kaliddy after reading a poem with antisemedic comments. As long as the media keeps giving cover he can continue the rope-a-dope to the end. I just hope the results isn’t the election of a full fledge socilist/communist. I think it was Ben Franklin that said “those that would give up liberty for security shall have neither” KEVIN It is not in the constitution that the Government has the right to Take at gunpoint , my money and give it to someone else. In this country if you work hard, stay off of drugs and alcohol and wait until you have a job and a place to live to have children you can reach what ever you desire. To reward someone for lack of disipline and selfcontrol is not compassion. It is vote buying. Just so you Know the definitions of the words we speak. When the government redistributes wealth based on social and political justice we are well on our way the the end game described below. That is what was so telling about Obama’s slip of the tounge when he said “When you spread the wealth around”. Superdave nailed it on the head. Any of various theories or systems of social organization in which the means of producing and distributing goods is owned collectively or by a centralized government that often plans and controls the economy. The stage in Marxist-Leninist theory intermediate between capitalism and communism, in which collective ownership of the economy under the dictatorship of the proletariat has not yet been successfully achieved. A theoretical economic system characterized by the collective ownership of property and by the organization of labor for the common advantage of all members. A system of government in which the state plans and controls the economy and a single, often authoritarian party holds power, claiming to make progress toward a higher social order in which all goods are equally shared by the people. The Marxist-Leninist version of Communist doctrine that advocates the overthrow of capitalism by the revolution of the proletariat. The only mistake was biden twith the 150k comment. But, Obama has said that if you make less than 250k, your taxes will not go up one dime. And, that if you make less than 200k, you will get tax cuts. So don’t take a mistake by Biden and take it out of context to suit your propaganda. Obama is for the second amendment 1superdave, and, for your info, taxes are taking your money away from you for something else, so according to your definition we are in a socialist country already? Second, in this country if you work hard, etc, etc, as you said, yes, you will achieve what you want. There is one problem. That doesn’t apply to everyone. Especially non-white people. There is plenty of racism around, and just because you are not racist or are not associated with racism doesn’t mean it exists. Third, If I were rich, I wouldn’t mind the government taxing me 3% more, thats right, so that it can cover for giving the middle tax cuts. This is how I look at it,(hypothetically) I have a job, I make less than 40K a year, and I’m struggling to pay my bills. I have done everything by the book, to the letter. It’s not my fault we are in this crisis, so I would really appreciate a tax cut; instead of giving it to CEO’s like John McCain is planing. You think they have a hard time? Especially after how inept we have seem most of them be? Please, give me a break! It’s just a matter of us thinking differently to solve a problem. The problem is, you really have it stuck in your mind that Obama is going to take this country into shambles because he raised taxes on the well off and the rich. Also, John McCain and Sarah Palin say that they are going to balance the budget in their first term. HA! (Like Chris Matthews’ HA!) You really think spending 10Billion a month in an unnecessary war is going to help the budget? Oh wait, pork, I forgot pork. silly me for not noticing it, as it only account for less than 1%. It’s always easy to be againgst something. Be for something; for a change! I have read all the previous comments. Based on each comment I must assume not one of you know anything about political nor economic systems. Obama’s redistribution plan is complete Marxist Socialism. Which is to be expected considering at one point in his career he ran under the New Party; this generation’s Socialist party. Just to put imagery to Obama’s “redistribution” plan. It would be the equivalent of you going to eat a meal and giving the tip to the homeless guy outside because you think he deserves it more. Alternatively, think of robbing a bank and coming out to tell the police it’s all going to Jerry’s Kids. That is wealth redistribution and class warfare at it’s best. It does nothing but buy votes. When you rob Peter to pay Paul, you can always count on Paul’s support. Obama has made people believe two things that are completely untrue. First and foremost, Obama has convinced people that life is zero-sum. Meaning that an individuals level of success is dependent upon another’s level of success. In example, I am successful because someone else is not or vice versa. Rich people are only rich because someone else is poor. This is a false ideology and completely false. Your individual success is determined only by the choices you make. By Obama raising taxes on the wealthy, he is crippling the very people who sign your check, provide your goods and services, and ultimately employ each and every one of you. In order for these people to pay taxes they raise prices, hold of on pay increases, or refuse to hire new employees. Truth is corporations and businesses do not pay taxes. They build it into their prices. So when Wal-Mart and Kroger taxes increase they will increase their prices. So any tax cut you have received from Obama you end up spending on higher cost of living because of raised taxes on corporations. It is all smoke and mirrors and the American people are sucking it up. The second misconception that Obama wants the people to believe is that equality and liberty can coexist. By their very definition they are canceling of one another. In order to provide my neighbor with equality I must give up a little liberty. Whether that be in the form of deciding not to strive to earn more money so that I pay ridiculous taxes in the name of his equality, or that I give up my right to own firearms so he can have equal safety. In order to increase one you must take away from the other. I also see many comments about CEOs running companies into the ground and then receiving “golden parachutes”. Which also leads me to assume you know nothing about the hierarchy of business models. A CEO is nothing more than an Chief Officer to direct the company in the direction ordered by the Board of Directors. Every company has one, and you do not have to know anything about that said company nor business to be on one. Joan Crawford and Pepsi Cola comes to mind. The CEO is a contracted position with a salary that has little to do with the success of a company. I understand the frustration of taking a bonus after the company failed, however let me provide you with a flipped scenario. Let us assume you owned a company that provided servers for companies. You also provided maintenance to those servers should anything go wrong at the rate of $1200 a year. If the year should go by and nothing go wrong and you ever had to make a trip to the company to fix anything should they be able to ask for the $1200 back? They never had to use you right? While that position is the direct opposite the same logic applies. The CEO was a contracted employee with salary and bonuses in writing, some may have been dependent on share prices and some may have not. The bottom line is you can not stop paying or breach a contract because the decisions of not only him drove the company to failure. Otherwise you would end up in court paying not only the salary you promised to begin with but also added court cost and enormous lawyer fees. While a vote for McCain may not be what you want to do. I admit I had to hold my nose a bit as well being a conservative first and Republican secondly and not all the time. However, McCain is better economically, period. Top to bottom America will be better off under McCain in a cost of goods living situation. Something economist will not consider when examining the tax plans of both, all they care about is your tax-bill, that is really only half of the equation. What do you do for the other 11 months besides April? It seems American Conservatives don’t know what socialism actually is, and don’t actually care – it just makes for a great insult. Obama is certainly not a socialist from the viewpoint of other Western democracies which have socialist governments or institutions. Here in Australia we have universal health care – and amazingly our society has not collapsed! (There’s also the argument to be made that a high level of public health is an economic asset.) There’s no good reason a country can’t have a thriving capitalist sector and a welfare safety net at the same time. Redistribution of wealth alone is not the predication for socialism. Wealth redistribution occurs in every form of government. In capitolism, redistribution can be found in taxation and subsidies, domestic and social government programs such as Social Security/Unemployment Benefits/Workers Compensation/Medicare/Welfare, and interest rate adjustment. Wealth redistribution under socialism occurs through the nationalization of production and distribution of goods and services. Redistribution of wealth is a fancy buzz word being thrown about when in reality it’s an inescapable fact of government…period. America has been and will always redistribute wealth ergo take tax dollars from one place and put them in another. The only question is to what degree do you want a democratic government to redistribute wealth. I can only assume your referring to the idea that Obama wants to cut taxes for middle income individuals and raise taxes on business’ and the rich. Trickle down economics is no different, just an inverse policy. The more success business’ and the rich experience correlates directly to the success of those lower on the economic ladder. Demand pull inflation occurs when demand begins to surpass supply which is caused by increased spending in the private sector. The swing sways both ways. Regardless, there are innumerable factors that effect the economy and inflation – tax policy is but one part of the equation as you put it. When tax policy is designed to be punitive and tax rebates go to people who don’t pay any taxes that is Marxist. “From each as he is able, to each as he has need”. The math simply does’t add up to say 5% of tax payer will pay 3% more. Lieing about your intentions is also a markist ploy. And you don’t compare democracy to socialism or communism. You compare it to capitlism. Social programs are socialistic and never were intented in the constitution. Nick; I think you need to read 1superdav and me again. Nick: you are spot on. No. It’s not Marxist and it’s not Socialism. It is actually Social Democracy. Wealth redistribution through disproportional taxation does not meet the aim to abolish class definition all together. Nor does it meet the requirement for capitol investment and the distribution of goods and services to be shifted away from the private sector. huxbux The only way in a democratic capitalist form of government, such as we have, to bring about a total switch to a marxist type of government, is through incrementalism. The begining had it’s founding in the Great society, after the Great Depression with the ccc work program and the social security program. Then add medi-aid, medi-care, aid for dependant children(which destroyed the black family), the welfare program, the afordable housing programs, the earned income credit( a tax rebate for people who don’t pay taxes, also responsesable for destroying marriages), subprime mortage programs( that said banks had to lend money to people that aren’t credit worthy), the medi-care drug program, and on and on. Then enters Obama and he’s going to take from the rich and give to the poor and all the people who have grown to be dependant on the government now out number the socalled rich and will vote for him. If elected he and the dem controled congress and the complisit media will implement all the taxes that he will need to pay for all the promises he’s made. It will tank the rest of the econemy. The natural progression to communism is then to procede to socialism which is allready begining to be implemented with the financial bailout, which is only necessary because of the tax burden that will stagnate investment. What part of that isn’t marxism. That’s right, mudflats, it’s not about trying to help the poor, it’s all a big Communist conspiracy. But you forgot about the Jews! They eat babies, I tell ya! Economic and political theory is far more nuanced then you make it out to be. Marxism, as a practiced political apparatus, is pretty much dead in the water. Likewise Marxist Socialism and Communism is all but dead except in only a handful of countries. It is a far leap to go from social democracy to socialism and communism – in order to do that you need to institute egalitarian distribution of wealth and nationalization of industry that distributes goods. Your chronological assumption that social democracy leads towards socialism/communism is backwards. Social democracy was developed as a political and economic theory out of classic socialism in response to it’s obvious failures. It would be analogous to owning a 2008 BMW 700i and turning it in for a 1990 BMS 500i. Political theory climbs up the ladder, not back down. Yes, these are social democracy programs, but that does not mean it is going to climb back down political theory ladder to the inferior theory social democracy was borne from. Social democrats are of the belief that a free market economy must remain private as it concerns the distribution, production, and pricing of goods and services. The only areas social democrats wish to nationalize are education, health care, and related services. So, why would social democrats divest themselves from their political belief system and revert back to classic Socialism and then to the even more archaic Communism? Yes, a government tax credit is responsible for ruining marriages. Cultural mores, personality conflicts, adultery, and financial matters never play a role in a marriage ending. You would have been better of saying “The Earned Income Tax Credit” encourages people not to get married. You don’t need to get married to qualify for the EIC, just pop out a kid. That’s easy enough. I presume your referring to the CRA as it’s been an in vogue of late. Subprime loans that fell under CRA regulation only account for 37% of all subprime mortgage loans. CRA subprime loans have a similiar default rate around 9-10% in the last several years. The CRA was enacted in 1975. The majority of CRA regulated loans were not subprime or ARM. They were low-risk, fixed interest rate mortgages. So, a government regulation enacted 23 years ago that accounted for a minority of all subprime loans and share comparable default rates as non-CRA subprime loans waited around for 23 years to create a mortgage crisis? No. You would be better served to go point the finger at several causes – Federal Interest Rate policy, capitol reserve reductions for lending institutions, poor risk management models, and ineffective regulations. I know it’s contrite to be able to point to a single piece of legislation that a Democrat enacted 23 years ago for the economic crisis were in now, but the economy is far more complex then either you, me, or the professionals choose to admit. The CRA is not perfect, but it’s not to blame either. It is not market capitalism and it is vote buying, and someone once elected could do what hugo chaves and nationalize the oil companies because of the energy crsis etc… It can happen anytime and we could end up with 3rd world commounism in an instant. Its really comical at how all conservatives say its gonna be the end of the world, or at least democracy, if Obama is elected. It just is. Listen, aren’t we now techincally in an economical crisis? Aren’t taxes “low”? Has that had any effect? It sure has! There is no such term “market capitalism” in economic theory. There is market economy and capitalism which are both distinct concepts. The former centers around the idea that the pricing of good and services should be determined by supply and demand. The latter stipulates that the production of those goods and services are openly and freely distributed by the private sector. Capitalism presupposes the existence of a market economy. You can’t have capitalism without a market economy, but you can have a market economy without capitalism. Semantics aside, pure capitalism i.e. laissez-faire economics, hasn’t existed in this country since prior to the Civil War when we moved closed to a mixed economy. The debate between how much government should regulate and involve itself in economic matters has been going on in this country for a very, very long time. Sure, under an hypothetical situation, our economy could tilt heavily towards Socialism and we could see the nationalization of the private sector. We could move away from a market economy and towards a fixed priced system. But there is no indication from either candidate in their policies that suggest nationalization, and posing such a situation is just unfounded, wild speculation. I could just as well say that McCain will nationalize the oil companies to address the energy crisis. Neither candidate has ever laid out a socialist economy policy in the classic sense(nationalization). Both candidates economic polices qualify as supporting a market economy and capitalism. Neither candidate’s economic policies advocate a true laissez-faire form of capitalism. The differences in policies are as to the degree of government regulation and intervention in the economy which has been going on since the foundation of the United States, and to a greater degree following the Civil War. If you have any historical or policy indicators that suggest, if elected, Obama will allow the price of goods to not be determined by supply and demand, and that he is going to shift the distribution of goods and services away from the private sector, then present it. Otherwise, your posing a “what-if” scenario without the “if”. Making hypothetical statements without any predication as to their possibility of occurring does not make a constructive conversation. Since obama lacks any real experiance to know his veiws on such thing as we are talking about , one only has his association to form a reasonable idea as to what he believes. As late as last night, Charlie roades and Tom Brocaw were Discusing how little they know about Obama. That is due to the fact that they, the media , are in the tank for Obama and have not done the normal vetting that canidates get. Say, like that Sarah and Joe the Plumber Got. So it leaves us to form conclusions based on comments that have slipped out, ie when you spread the wealth around, and associations, ie wright, ayers, kalidi, and others. Then you hear past interveiws he gave where he says the warren court didn’t go far enough when dealing with civil rights, in that the court didn’t address social and economic justice. In that same interveiw he talked about weath redistrebution as a means to bring those things about. In summary, if someone surrounds himself intentionally with people that openly espouse maixist views, hate Isreal, and hate America, then a thinking person has to think that’s where he will govern from. I thought you were objective? Or at least not such a partisan. But you eat up your talking points like there is no tomorrow. To be honest, I’m tired of hearing about Obama for the past 2 years. All I know about Palin is that she is not experienced to be vice president. I’m pretty sure anyone working in McDonald’s is able to be VP, because they go through 2 or 3 interviews before they are hired, and Palin only went through 1. I don’t have to bring up every single thing in McCain’s closet just to make a point. Joe the Plumber is an opportunist and a liar. He’s not a plumber. His name is not Joe. He didn’t have the money to buy the Plumber company, and he would benefit more under Obama’s plan. He’s a typical conservative that doesnt go beyond the bible and the rhetoric in choosing his candidate. When Ronald Reagan’s Chief of Staff endorses Obama, you know there has to be something right!!?? This interview has been misrepresented for purposes of becoming an attack ad, and your characterization of the interview is just a repetition of those misrepresentations. He is not saying the Warren Court should have gone far enough. He is saying the Warren Court and the Court as a whole is not able to go farther. Obama then goes to explain that rather then the courts, the place where redistribution civil rights change can happen is in the community. That is a dangerous mischaracterization on McCain’s part. Obama said the tragedy was that the civil rights movement was court focused, but thinks it should have been community focused. The salient point being is that Obama said that he believes wealth redistribution should be handled by “community organizing activities” or community activism. No where does he suggest that the government should redistribute wealth. Yes, Obama believes the civil rights movement should have included redistribution of wealth, but he believes it should be done through the community and not the government. The government can only address the legalities of the civil rights movement. Obama doesn’t currently have any association with any of these three individuals. None of these persons are involved in the Obama campaign or possible adminstration. The Ayers connection exists but it’s a stretch to call him a “mentor” because both were activists in Chicago’s Hyde Park. In a small community, political activists on the left are bound to intersect paths, but to say that Ayers corrupted or shares Ayers same views is ludicrous. By that logic, anyone Ayers every came into contact with in a professional capacity is a Marxist terrorist. The guilt by association for Obama with Khalidi then be fair and tag McCain with a guilty verdict. McCain chaired the group IRI which gave $448k in grant money to an organization founded by Khalidi, the Center for Palestine Research and Studies. Does this make McCain anti-semitic? No. Nor does it make Obama anti-semitic because he attended a ceremony celebrating Palestinian culture. Yes, Obama met Khalidi at the University of Illinois Chicago and had a relationship with him. But Obama has also stated that he disagrees with many of Khalidi’s views. It seems that some people, such as yourself, would prefer that anyone with opposing views, however radical, or anyone with a criminal past should forever be exiled. You shouldn’t talk to them. You shouldn’t participate in any activity involved with such a person because you are then just the same as they are. You are guilty of their criminal acts. Your ideology becomes the same theirs. Your an automaton copy of anyone you’ve ever been associated with. I disagree. A thinking American would not take the route of grouping people into nice, neat little ideological piles. Your a Democrat. Your a Republican. Your a Marxist. Your a terrorist. Generalizations are so we don’t have to think. So we can categorize people, and when we speak about them rather then considering the totality of what makes them an individual, we can retrieve a one-word label that summarizes the complexity of a person. It’s requires more brain power to have to retain a wealth of knowledge about a person and then find where they have both common and distinct intersections in personality that make up who they truly are. Who you associate with is, in large part, dictated by your circumstances. Who did you think a black Democrat activist and academic living in the inner city of Chicago was going to associate with? I seriously doubt a lot of right-wing white Republicans were running around Hyde Park. In order to avoid the “guilty by association” crime, he should have moved out to the suburbs, palled around with wealthy executives while practicing insurance law. Then we could have slapped the old right wing neocon tag on his forehead. I’d be remiss if I didn’t include something else about the 2001 interview. The portion that has been floating around the internet and everyone has gotten up in arms about doesn’t include the question the interviewer asked. That’s important because without it, everyone is left to frame their own question around the answer. You can’t take an answer to anything without first knowing the question being answered. In fact, the audio starts with the interviewer introducing Obama and then the audio is spliced as it stops and cuts to Obama in mid-sentence. So a portion of the audio was removed which would have to include the question asked. Why would you exclude the question asked? Maybe because it would frame the answer Obama gave in a different light? If you want full context of the radio clip, and not some youtube spliced piece of audio posted by people with agendas, then go to this website and listen to January 18th, 2001 hour long interview. You’ll find that the discussion is a historical discussion about the role the Courts played in the civil rights movement, and not a discussion about how the government needs to redistribute wealth. But an out of context audio bite sure makes for good news, doesn’t it? Words have meanings that if you put them into enough sentences the context stands alone. I did say in absence of a record, he has none largely because he voted present so many time to conceal his vote. I am against Obama not for Mccain. Had the liberals stayed out of our convention. We would have chosen differrently. George Allen was disqualify by a singale word(I am not even sure how it’s spelled, I think Macoca. Yet Joe biden said if you stop at a 7-11 you need an Indian accent. Doudle standard. I just lament that the drive-by-media will not and have not vetted this man. I think 1 year on the spotlight of the media is vetting enough. And you just confessed. You never vote for someone, you but against. That is the easiest thing in the world to do. Vote against someone. I guess words do have meaning. Bomb, bomb, bomb, bomb, bomb Iran! The “””health””” of the woman. His Choice? You know who. This says it all. You prefer to vote for someone that is reliant upon others to make the smallest of economic decisions. You realy think he understands what he’s saying. No. People like Phil Gramm give him a script, write his economic plan for him, and then say our Nation is a Nation of Whiner’s. Pathetic. Kevin!!!!!!!!!!!!!!!!!!!!!!!!!!!!!!!!!!!!!!!!!!!!!!!!!!! I didn’t say that as a normal thing I simply vote agaist the democrat. IN THIS Election. Mccain Is not my choice. I am afraid Of obama. Sarah is the only good choice he’s made. Charlie roades and tom brocaw on roades’s show were lamenting yesterday that they don’t know obama!!!!!!!! Yeah, the fact that you said Sarah Palin is the best thing he has done in this campaign makes me second-guess your judgement. Give me one policy attribute you find about Sarah Palin as right? She believes in Life Liberty and the Pursuit of Happyness. She is like me. She belives in God. She belives judges should be bound to the constitution and not find other works to base their rulings on. She doesn’t see the constitution as an obsticle to be removed. that’s not one but who’s counting. Yes, you can’t frame a word without the support of other words. Cherry picking words out of context evokes a visceral reaction. It’s important not to parse words otherwise your left with the connotative declination. So, I’d be interested to know what context the words “redistribution of wealth” were framed in during the hour long interview from your perspective? George Allen was not sabotaged by liberals. Allen never even made it to the Republican primaries. He suffered from a serious lack of support within his own party, and it showed in his inability to raise the needed campaign funds. In late 2005, Allen was in a dead heat with McCain in polls of Republican leaders for the nomination. By May 2006, the same poll of Republican leaders showed McCain a holding a 3-1 lead over Allen. The controversy over Allen and his racial comments along with his history of racial intolerance, didn’t become a topic of conversation in the media until August of 2006. While never formally announcing a run for the nomination, in December of 2006, Allen said he would not seek the nomination. George Allen wasn’t disqualified. He was never made the ballot for his own party’s primaries. He simply didn’t have enough support within his own party who favored McCain. The Macaca issue is a nonsequitur in why Allen didn’t earn the Republican Presidential nomination, much less even make it to the first primary. So, I’m not entirely clear as to how you come to the conclusion that liberals sabotaged the Republican nomination or a racial slur that occurred prior to Allen losing support within his own party caused Allen’s fall from grace. The signs of Allen’s demise are within his own party, and his poorly run campaign. Maybe the Republicans found Allen’s inability to talk in anything but football metaphors to be problematic for the Presidential Post? By the time Allen’s checkered racial history came into play, he was a falling star. It was just the nail in the coffin that turned a marginal nominee into an unworkable mess for the Republican party. The word is Macaca which translates to “monkey”. It’s a racial slur used in Europe to describe people from Morocco and North Africa(Allen’s mother is of French-Tunisian descent and Allen speaks French). What Biden said is deplorable. He is racially insensitive, but I don’t think he’s a racist. And that’s why I think the media and public reacted differently towards Allen and Biden. Allen has a long history of racial intolerance. His membership in a segregationist organization, his reported use of racial slurs towards African Americans in college, his open affinity for the Confederate flag, and his opposition to establishing Martin Luther King Day as a holiday in Virginia all created a pattern that resonated with the public. Another subtle, but still unacceptable difference, is the difference in how harsh Allen’s comments and actions are in comparison to Biden’s. Biden’s are crass and inappropriate. Allen’s have that venomous hate to them that the public reacts to harshly. It seems you can get away with being racially insensitive when you turn and twist it into some half-comical quip, but you get chopped off at the knees for saying a racial slur. I’m in no way excusing what Biden said. He is clearly insensitive to race issues, but he doesn’t have a history of denegrating other races does. Sometimes there are reasons beyond just the black and white partisan finger pointing and the “blame it on the media bias” excuses. It’s a valid concern for voters given Obama’s relative emergence from obscurity into the forefront of politics. It’s also expected that there’s not a large body of work to draw upon, and all we have to go on is the policies he’s laid out during his campaign, and how he’s managed his campaign itself. Just looking at his campaign, one of the most successful in history, you have to agree his management skills are impressive. Brokaw and Rose specifically asked what do we know about his advisors, his views on China, his foreign policy, his heroes, or the books he reads. I don’t know anything about the last two, but you can quite easily go do your own research and find the biographies of his advisors, and his speeches on China. I have. For foreign policy, that’s never easy to pin down for any candidate as foreign policy is largely dependent on the occurrence of future events, but his approach is more of a pragmatic one when it comes to dealing with other nations. I think this is particularly telling in how you evaluate Obama. It’s gives the impression of a more subjective reaction rather then an objective analysis. Note the inclusion of “Laws”. That would include any laws passed by the legislative branch and holds equal standing as the Constitution itself. The Supreme Court is bound to base it’s decisions framed from the Constitution and “Law”. The topic of judicial review was not new to the founding fathers as it has roots in England. While the Constitution never addressed judicial review, it’s clear the framers had it in mind at the time, and in fact, many state constitutions passed at the time explicitly provided judicial review as a power. While it was not a federal mandate, given the founding fathers views on judicial review as well as the state mandates in favor of judicial review, the Supreme Court found precedent for judicial review in the Constitution in the case of Marbury v. Madison in solidified the process of judicial review as a federal power of the Courts. One of the other “works” you might refer to is precedent which is inherent in judicial review. Precedent is a legal authority established by the Court in previous cases where a “Law” was either deemed constitutional or unconstitutional. It’s important because it carries weight in all court decisions. Although not binding, all Court decisions use precedent for legal analysis. Think of it as a guide rule for the Constitution, and a safe guard against rogue Court decisions. I really don’t know where you get the idea Obama wants to abolish the Constitution or appoint judges who are going to make decisions on anything other the US Constitution and “Law”. No President can just tear down the foundation of this country, and that’s the inherent beauty of the Constitution. I’m trying to have some substantial conversation with you, but it’s difficult when you continue to just repeat platitudes and make ill informed statements. « Analysis: Is The McCain Campaign Imploding?